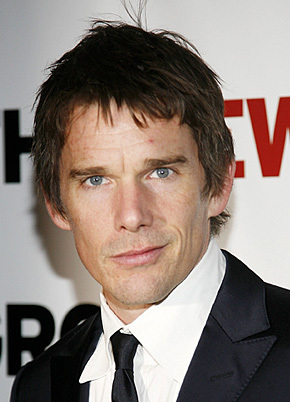 The Horror Honeys: Honey Buzz ~ Ethan Hawke as Doctor Strange? Whaaaaat? Honey Buzz ~ Ethan Hawke as Doctor Strange? Whaaaaat? Like the rest of the planet, I have kind of a love/hate relationship with Ethan Hawke. In the 90s, I hated him and his frosted tips and his slacker lifestyle (Ben Stiller had a good job and was NICE to you! Why did you choose Ethan, Winona? WHHHHY???). Now, thanks to Scott Derrickson's Sinister, I'm kind of just ambivalent about him. Okay: so it's an ambivalent/hate relationship. But now a website is reporting that he's in the final stages of being cast as Doctor Strange and that's... that's just not okay. While the majority of the news at This is Infamous comes via "inside sources" and "from what I hear's," the chain of events sounds credible enough. Apparently, talks with Joaquin Phoenix broke down in the final negotiation phase and Marvel told him that they "had other options." That other option was Hawke. If the article is to be believed, then negotiations with Hawke moved at a breakneck speed and he accepted the job last Friday. That means we could get an official announcement from Marvel any day now regarding the casting of Scott Derrickson's Doctor Strange. Sooooo... what do you think? Good idea/bad idea?